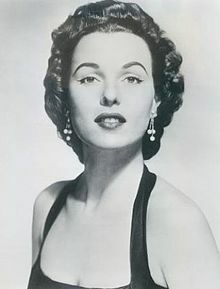 Bess Myerson (July 16, 1924 – December 14, 2014) was an American politician, model and television actress who became famous in 1945 as the first Jewish Miss America. Myerson is the only Jewish woman to win the title. Her achievement, in the aftermath of the Holocaust, was seen as an affirmation of the Jewish place in American life. She was a hero to the Jewish community, where "she was the most famous pretty girl since Queen Esther." Myerson made frequent television appearances during the 1950s and 1960s. She was a commissioner in the New York City government and served on presidential commissions from the 1960s through the 1980s, and ran unsuccessfully for the U.S. Senate. Her career in public service ended in the late 1980s when she was indicted on bribery and conspiracy charges. She was acquitted after a highly publicized trial. Myerson was born in The Bronx, New York to Louis Myerson and Bella (née Podell), who were Jewish immigrants from Russia. Myerson's father worked as a housepainter, handyman, and carpenter. After Myerson's birth, the family moved from the South Bronx to Shalom Aleichem Houses, a cooperative apartment complex in the northern Bronx. She had three siblings: a younger sister, Helen; an elder sister, Sylvia; and a brother, Joseph, who died at the age of three before Myerson was born. Her upbringing emphasized the importance of scholarship, not physical beauty. In addition to tradesmen, her neighbors included poets, writers, and artists. Myerson reached her adult height when she was 12, towered over other children, and has said she felt "awkward and gawky" during her preadolescence. Myerson recalled one of her worst childhood memories was playing the Popeye character, Olive Oyl, in an elementary school play. Myerson began studying piano when she was nine years old and was in the second class of New York's High School of Music and Art in 1937, graduating in 1941. She went on to Hunter College, graduating with honors in 1945 with a Bachelor of Arts degree in music. To support herself and her family while in college she gave piano lessons for fifty cents an hour, and worked as a music counselor at a girl's summer camp in Vermont. By the time she was 21, Myerson was 5 feet 10 inches (178 cm) tall with "luxuriant brown hair". Myerson was entered into the Miss New York City competition, without her knowledge, by John C. Pape, a retired steel magnate and amateur photographer who had employed her as a model while she was in college. When Myerson was told about the pageant by her sister, Sylvia, who was acquainted with Pape, Myerson was angry as she felt that the beauty business was "embarrassing." However, she was persuaded to compete by Sylvia, and she competed in the swimsuit competition using a borrowed bathing suit. Myerson went on to enjoy competing in the pageant, in which she stood out from the other contestants because of her height. On August 15, 1945, the day of Japan's surrender and on VJ Day, she won the competition for the pageant, and moved on to the Miss America competition, partly motivated by the $5,000 scholarship awarded to the winner. She later told interviewers she wanted to buy a black Steinway grand piano with the scholarship money. Myerson was the Miss New York entry in the 1945 Miss America pageant, and she competed in the talent portion of the contest by performing the music of Edvard Grieg and George Gershwin. Prior to the competition, she was pressured to use a pseudonym that "sounded less Jewish." Despite the news of the Holocaust, which was discovered in parts of Europe four months earlier, America still viewed itself as an Anglo-Saxon Protestant society which manifested hostility towards people of Catholic faith and Jewish ancestry. Myerson refused and was subjected to substantial antisemitism. After she won the title on September 8, 1945, three of the pageant's five sponsors withdrew from having her represent their companies as Miss America. With the pageant scholarship money, she paid for graduate studies at Juilliard and Columbia University. An aspiring pianist, she briefly gave recitals on the vaudeville circuit before realizing audiences were more interested in seeing her in a bathing suit. She also played with the New York Philharmonic and appeared at Carnegie Hall. While Myerson was on her year-long tour as Miss America, she encountered "No Jews" signs posted in places such as hotels and country clubs. Such experiences led her to conduct lectures on behalf of the Anti-Defamation League (ADL) entitled "You Can't Be Beautiful and Hate". Myerson became a vocal opponent of antisemitism and racism, and her speaking tour became the highlight of her Miss America reign. A few years after hearing her speak at an ADL function, television producer Walt Framer hired Myerson for the 1950s game show The Big Payoff. She was the "Lady in Mink" modeling the grand prize mink coat, and introducing guests and prizes, throughout the 1951 to 1959 network run of the program. Recognized for her wit and hard work, as well as her beauty, in 1954 Myerson was a panelist on the game show The Name's the Same and from 1958 through 1967 a panelist on I've Got a Secret. She regularly substituted for Dave Garroway on the Today Show. She was also a host of the television broadcast of the Miss America pageant from 1954 to 1968. Myerson stepped down from her other commitments in 1969 when appointed by Mayor John V. Lindsay to become the first Commissioner of the New York City Department of Consumer Affairs. Her career as a commercial pitchwoman for a number of products throughout the 1950s and 1960s had led to her becoming a consultant to several consumer products companies. In her consumer affairs position, which she held until 1973, she became a pioneer in consumer protection law. She also served on several presidential commissions on violence, mental health, workplace issues, and hunger in the 1960s and 1970s. Throughout the late 1970s and the beginning of his mayoral ambitions, Myerson was a frequent public companion of then-Congressman Ed Koch and later chaired his successful 1977 campaign for New York City mayor. In 1980, Myerson vied for the Democratic nomination in New York's U.S. Senate race against Congresswoman Elizabeth Holtzman, Queens District Attorney John J. Santucci, and Lindsay. Myerson lost to Holtzman by a slim margin. Holtzman was subsequently defeated by Al D'Amato, who had defeated incumbent Senator Jacob Javits in the Republican primary. In 2002, Myerson appeared in the documentary film Miss America as a former Miss America interviewee. After assuming a prominent role in the Koch administration in 1983 as Commissioner of the Department of Cultural Affairs, her career became overshadowed by scandal. She became romantically involved with a married sewer contractor, Carl Andrew Capasso. It soon emerged that Hortense Gabel (the judge involved in Capasso's divorce case) had started socializing with Myerson. Judge Gabel's daughter (Sukhreet) was also hired by Myerson. After Gabel cut Capasso's child support payments, investigations began as to whether or not she had been bribed. In April 1987, after she invoked the Fifth Amendment, Myerson was forced to resign her position with the Koch administration. The scandal became known as the "Bess Mess". Indicted a year later by the office of then–U.S. Attorney Rudolph Giuliani, Myerson, Capasso, and Gabel were tried on federal charges of conspiracy, mail fraud, obstruction of justice, and using interstate facilities to violate state bribery laws, accused of conspiring to reduce Capasso's child support payments. With Sukhreet as the prosecution's chief witness, the main issue at the U.S. District Court trial was whether Myerson's decision to hire Sukhreet constituted bribery. After four months of trial proceedings, all three defendants were acquitted. Capasso was separately convicted of unrelated tax charges. In October 1946, Myerson married Allan Wayne, a recently discharged U.S. Navy captain. They had one daughter, Barbara, born in 1948. The marriage was marred by domestic violence, and the couple divorced after eleven years. Myerson's second marriage was to attorney Arnold Grant, and he legally adopted her daughter in 1962. The couple divorced in the early 1970s. Daughter Barbara later became an actress, director, and screenwriter who is now known as Barra Grant. Before her federal trial began, Myerson was arrested in May 1988 for shoplifting in South Williamsport, Pennsylvania. She pleaded guilty to retail theft and was ordered to pay a fine. Myerson survived ovarian cancer in the 1970s and experienced a mild stroke in 1981, from which she made a full recovery. She moved to Florida in 2002, and later moved to California, where she remained until her death. Myerson donated funds to help build "Bessie's Bistro" at the Jewish Museum of Florida-FIU in memory of her parents Bella and Louis Myerson who lived in the neighborhood near the Museum. In 2013, she was reported to be suffering from dementia. Myerson died on December 14, 2014, in Santa Monica, California, at age 90. Her death was not publicly announced and was confirmed by the Los Angeles County Coroner's Office three weeks after she died. Myerson was interred at Woodlawn Cemetery in Santa Monica. ^ Fermino, Jennifer (5 January 2015). "Ex-Miss America, New York City politician Bess Myerson dead at 90". The Daily News. Retrieved 7 January 2015. ^ a b c d e f g h i Green, David (2014-07-16). "This day in Jewish history/A Jewish Miss America who scandalized the press is born". Haaretz. ^ "New York Historic Districts Council". 6tocelebrate.org. 2013-08-07. Retrieved 2017-04-26. ^ Adam Wisnieski (May 25, 2011). "Shalom Aleichem owner will fight to stay". The Riverdale Press. p. 2. Retrieved January 6, 2015. ^ a b c d e f g h i j Woo, Elaine (5 January 2015). "Bess Myerson, Miss America who rose in politics and fell in scandal, dies at 90". Los Angeles Times. Retrieved 6 January 2015. ^ a b c d e f g "Jewish Women's Archive: Bess Myerson". Jewish Women's Archive. Retrieved September 4, 2011. ^ a b Berman, Susan (14 November 1977). "Bess Myerson Is One Tough Customer". New York. Retrieved 5 January 2015. ^ Halper, Donna (2014). Invisible Stars: A Social History of Women in American Broadcasting 2d ed. M. E. Sharpe. pp. 132–133. ISBN 9780765636706. ^ Kevin Eckstrom, Religion News Service (6 January 2015). "Bess Myerson on being the first (and only) Jewish Miss America". Washington Post. Retrieved January 7, 2015. ^ McCallister, Doreen (6 January 2015). "From Miss America To Tabloid Fodder: Bess Myerson Dies At 90". The Two Way (blog). National Public Radio. Retrieved 7 January 2015. ^ "Bess Myerson, First Jewish Miss America, Dies at 90". Voice of America. 5 January 2015. Retrieved 7 January 2015. ^ Salkin, Jeffrey (6 January 2015). "Why Bess Myerson still matters". The Washington Post. Religion News Service. Retrieved 7 January 2015. ^ Lepson, Lisa. "Bess Myerson". Encyclopedia. Jewish Women's Archive. Retrieved 7 January 2015. ^ "Lindsay Names Bess Myerson to Aid Shopper" (PDF). The New York Times. 3 February 1969. Retrieved 19 January 2015. ^ Murphy, William (5 January 2015). "Bess Myerson, first Jewish Miss America, television star and NYC's first consumer affairs commissioner, dies at 90". Newsday. Retrieved 6 January 2015. ^ Susan Berman (November 14, 1977). "Bess Myerson Is One Tough Customer". New York Magazine. Retrieved March 18, 2015. ^ a b Saulny, Susan (15 March 2001). "Carl A. Capasso, 55, Figure in 80's Trial With Bess Myerson". The New York Times. Retrieved 23 January 2015. ^ "Miss America Wins Again". Time. January 2, 1989. Retrieved November 26, 2010. ^ "Milestones, October 28, 1946". Time. October 28, 1946. Retrieved September 4, 2011. ^ "Bess Myerson Is Accused Of Shoplifting". New York Times. May 28, 1988. Retrieved January 14, 2011. ^ "Myerson Pleads Guilty to Shoplifting Charge in Pennsylvania". New York Times. July 16, 1988. Retrieved April 23, 2014. ^ "Jewish Museum of Florida". Jewish Museum of Florida-FIU. ^ Soloff, Emily D. (6 October 1995). "Bess Myerson reflects on fame, Miss America and Judaism". JWeekly.com. Retrieved 5 January 2015. ^ Green, Michelle (29 June 1987). "Downfall of An American Idol: How Did Miss America Bess Myerson, Famous for Her Beauty and Brains, Get Entangled in a Growing Political Scandal?". People. Retrieved 5 January 2015. ^ Dillon, Nancy (2 February 2013). 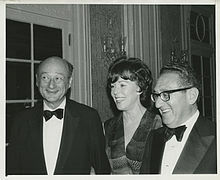 "Ed Koch's pal, former Miss America Bess Myerson, was a constant at his side". The Daily News. Retrieved 5 January 2015. ^ Bernstein, Adam (January 5, 2015). "Bess Myerson, a Miss America tarnished by scandal, dies at 90". Retrieved December 18, 2017 – via www.WashingtonPost.com. ^ "Bess Myerson (1924-2014)". Find A Grave. Retrieved December 18, 2017. Alexander, Shana (1990). When She Was Bad: The Story of Bess, Hortense, Sukhreet & Nancy. New York: Random House. ISBN 0394576063. Dworkin, Susan (2000). Miss America, 1945 : Bess Myerson and the year that changed our lives (1st pbk. ed.). New York: Newmarket Press. ISBN 1557043817. Preston, Jennifer (1990). Queen Bess : the unauthorized biography of Bess Myerson. Chicago: Contemporary Books. ISBN 0809245302. Shindle, Kate (2014). Being Miss America: Behind the Rhinestone Curtain. Austin: Univ Of Texas Press. ISBN 0292739214. Wikimedia Commons has media related to Bess Myerson.